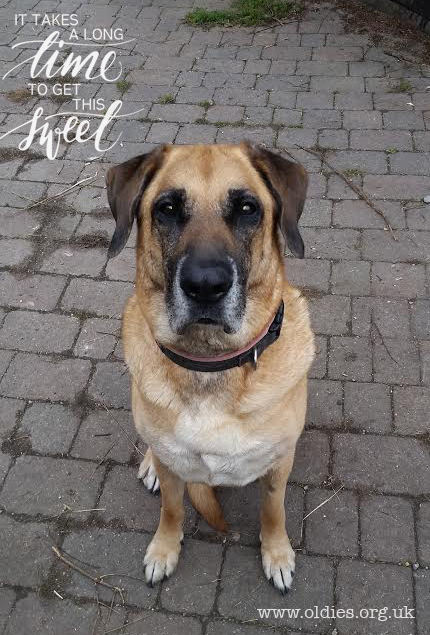 Hi, I’m Super Sadie, a beautiful (they tell me) ten-year-old Great Dane x Mastiff girl, who came into Oldies Club care in August 2015. Update: 22 September 2015 – I had to return to the vets to have a growth removed from my foot (I’ll spare you the details) and from my flank. My vet bills to date have now reached £2,381.65! Sadly I was found to have two mammary tumours and I was booked into the vets to have surgery to remove the tumours this week. Oldies Club had previously been given an estimate of £750-£850 for the surgery, but I had to be kept under for ages and used up a whole oxygen tank! The vet removed 11 small lumps and 2 large ones. Thankfully, and of course most importantly, I came through the surgery fine. Oldies Club is however facing a vet bill for me so far of £1,801.60, which is a lot of money for a small charity to find, so I have set up a fundraising page (with some assistance, because I’m recovering from my operation) to help them raise the money to cover the cost. Please click HERE to donate.